← Photo of the week: Here’s to you! Recently there have been some exciting developments at the Obit Report blog. The Obit Report has always celebrated notable people who have passed away – people like Betty Ford, Pat Morita, Marilyn Monroe, and more. Blog fans will know that in the past few months, we’ve also begun spotlighting extraordinary stories of ordinary folks, brought to us by the Society of Professional Obituary Writers. Thanks to SPOW, we’ve been able to feature stories about a soldier’s tragic love, a track star who sank into obscurity, a chaplain who worked at Ground Zero, and other tales both big and small. We have lots more great stories from Obit Magazine lined up for the weeks and months to come, and we can’t wait to see what else they have in store for the Obit Report. In other news, we have recently begun featuring the Obit Report prominently on the obituary pages of our newspaper affiliates. Now, readers of the Chicago Tribune, LA Times, Boston Globe, or nearly all of our other 900+ newspaper affiliates can follow the Obit Report right from their newspaper’s web site. Each day, the two most recent Obit Report stories will appear on the left side of the page, just below the featured obituaries. If one of the features catches your eye, you can click directly on the photo or name to read the full story. 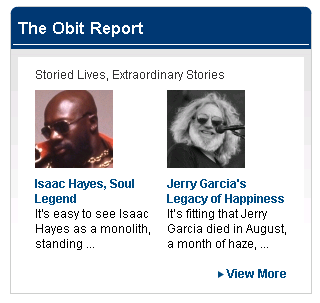 Or you can click “View More” to see a list of all the Obit Report posts for the current month. You can browse previous months with the drop-down date menus, too. 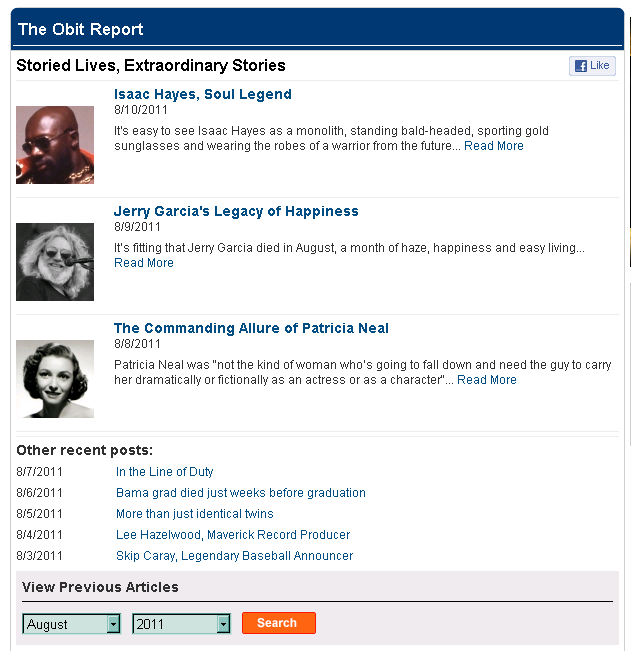 We hope you’ll enjoy the convenience of being able to access the Obit Report easily, whether you’re visiting your local newspaper’s web site or browsing the Legacy.com home page. And with our new content from Obit Magazine, there are more reasons than ever to check out the Obit Report daily. This entry was posted in New from Legacy.com and tagged Life at Legacy.com, Obit Report, Obituaries. Bookmark the permalink.